FUNNY AS HELL: We have never been the type to sit down and watch too many musicals, those damn show tunes keep getting stuck in our head.... but we get a kick out of watching the plight of Flight of the Conchords' Bret McKenzie and Jemaine Clement as they make their amusing (and musical) way through their day. The Grammy-award winning duo from New Zealand have done much to blur the line between comedy and music. Return of the Kings: It's a fine line that doesn't get rubbed out of sight too often. 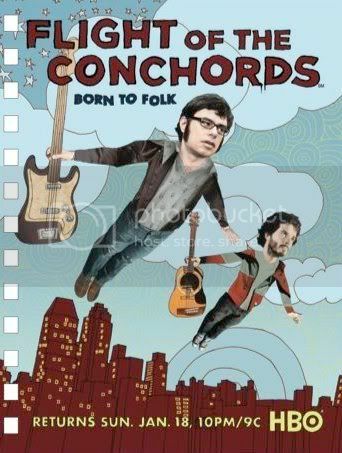 Flight of the Conchords Season 2 premieres on HBO on 1/18/09 at 10PM EST. VIDEO: Entire Episode One from Season 2! 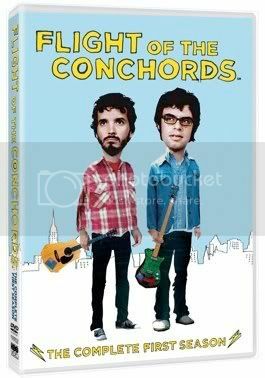 Email us with "FLIGHT OF THE CONCHORDS" in the subject line. Open to US residents only at this time. Sorry! Winner Gets: A COPY OF THE SEASON DVD! A FOTC guitar pick, a FOTC poster and postcards. Thanks for the heads up. I am almost tempted to re-subscribe to HBO, purely on the basis of the Conchords. Those guys are funny .... and talented. Loved the episode where they had to dress up as Hobbits to cash in on the New Zealand connection. Great dancers too! Love Bret's taste in sweatshirts..